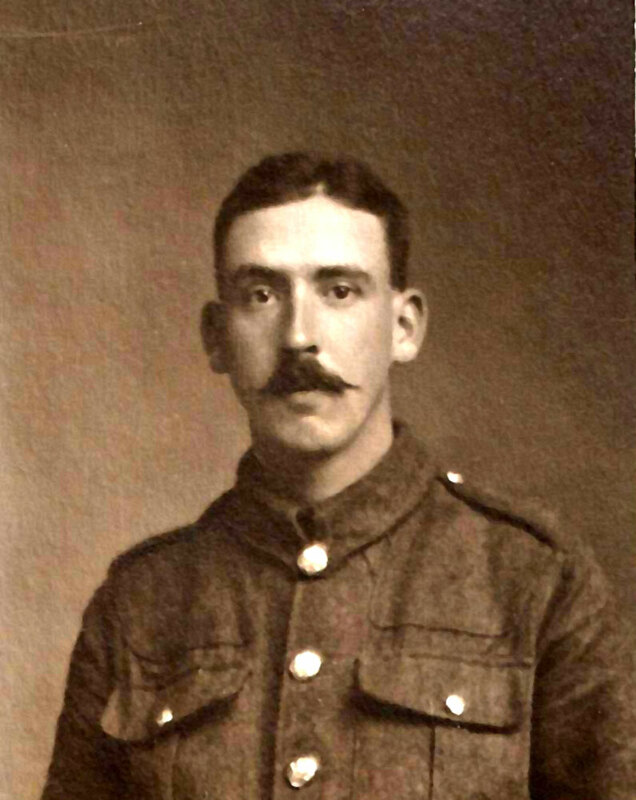 Peter was born in 1890 in Mold. The1891 census tells us that the family lived in 7 Stanley Street, Mold. Peter was an 8 month old baby living with his father James a 35 year old coal miner, his mother Esther also 35. The children were Henry 15 a tin plate worker, Ellen 13 and Esther 11 who were both scholars, |James was 3 and finally Peter. Ten years later in 1901, we find the family living at 82 Wrexham Street, Mold. The father, James 45 had changed his job and he was now a Life Insurance Agent. Esther the mother was now 45 and the children at home were James 14, Peter 10, Hannah 8 and May 4. In the 1911 census the family was back in Stanley Street- this time number 3. The father James was a 55 year old Insurance Agent working for the Prudential. Esther was 55 and worked on ‘Home Duties’. James was 23 and was a ‘Mineral Water Labourer’, Peter was 20 and was a ‘Bottler at Mineral Water Works’ (Both of these stated that their work was carried out ‘at home’.) Hannah was 18 and May was 15 both said to work as domestics at home. The form tells us that Esther had given birth to 8 children in total, seven of whom were still alive. 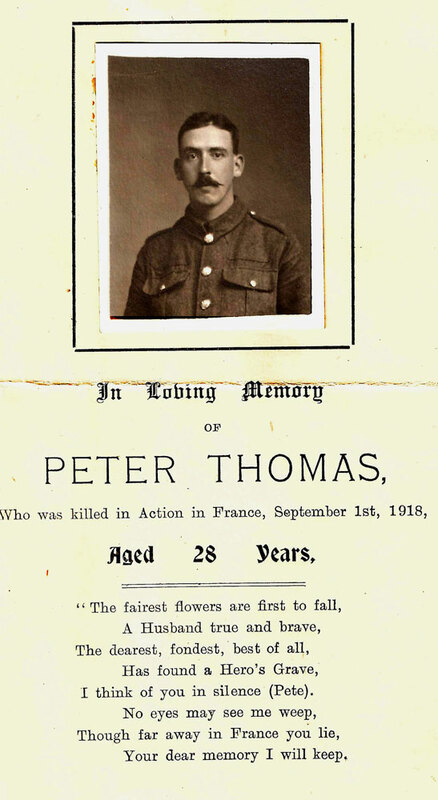 We believe that Peter married in 1915 when he was 24. 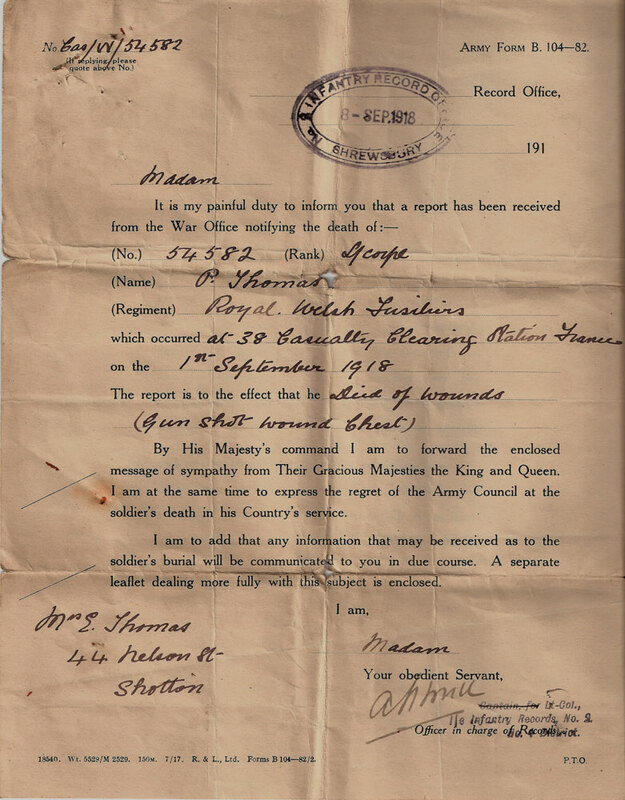 His wife was Elizabeth (nee Hughes) and her address on the Commonwealth War Grave Certificate is Mostyn Cottage, Milford Street, Mold. 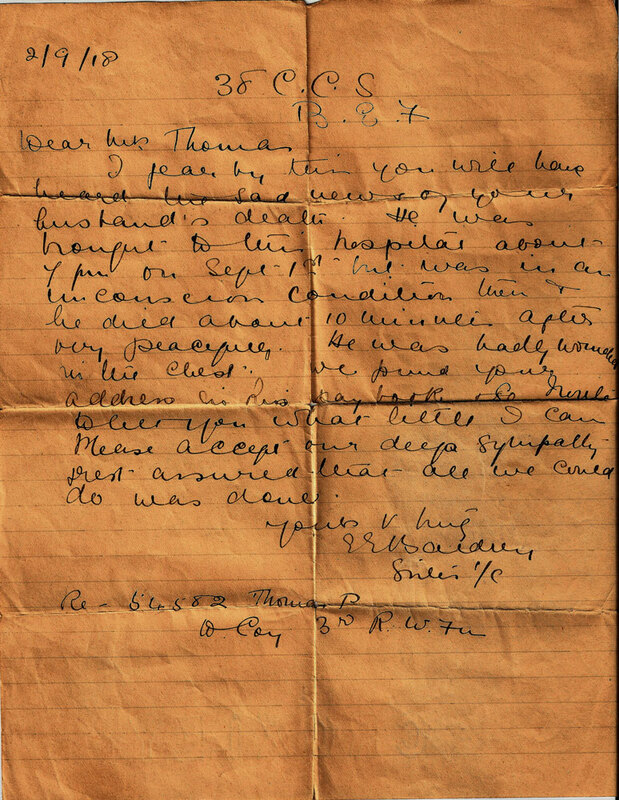 Letter to Peter’s wife from the Sister in charge at the hospital where he died. 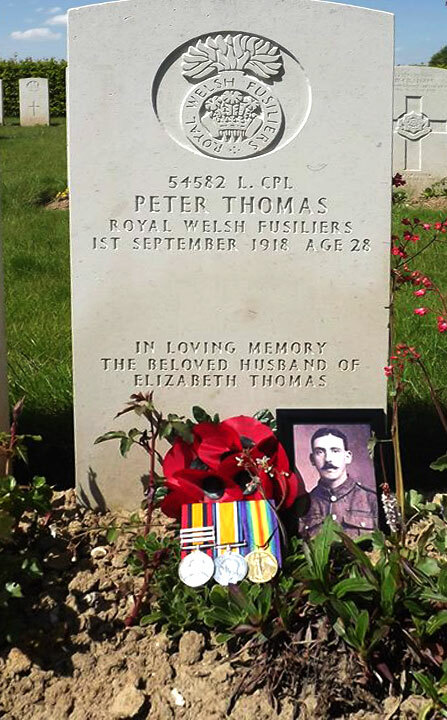 Many thanks to Peter Thomas, the Great Grandson and namesake of Lance Corporal Peter Thomas. He has provided us with all the images on this page.